Above: Chief Ernie Salas of the Kizh-Gabrieleño Nation. The tribe has been indigenous to the Los Angeles region for thousands of years. All photos courtesy of the tribe. LOS ANGELES — For generations, it was simply known as “the river” — or “wenot” in the local dialect — for its healing minerals and voluminous size. No other local waterway carried as special a title. Today the Los Angeles River is a 51-mile, mostly concrete channel running through 17 cities across Los Angeles County before streaming into the mouth of Long Beach’s coast. A multi-million dollar plan to revitalize the LA River and restore it to some of its former glory is now underway, with planners touting its indigenous history as inspiration. But some indigenous tribes in the area say their voices have been excluded from the planning process. “We haven’t had a sit down with the main players of all this…” says Teutimez. Heads of the nearby Gabrielino-Tongva tribe say they have also not received an invitation to meet with any of the planners. Los Angeles County is updating its LA River Master Plan for the first time since 1996. The plan is expected to be complete by 2020, and will involve joint efforts between the County, City and U.S. Army Corps of Engineers. As part of the process, public agencies and community groups have helped draft more than 200 proposals that are expected to bring numerous environmental and health benefits to communities along the river. These include replacing concrete slabs with green space in park-poor areas, connecting neighborhoods via scenic bridges, restoring habitats, and more recreational perks like horseback riding, kayaking, and soccer fields. Replacing the miles of concrete that cover the area with permeable soil will also help to capture more of the toxic runoff that currently flows onto Long Beach shores, and aid in the county’s plans to enhance stormwater capture. The update comes after years of smaller revitalization projects at various points along the river, during which time Teutimez says there was little effort to connect to tribal communities. Tribal family members harvest tule by the Los Angeles River, often used by the Kizh for basket weaving. Miguel Luna is a community liaison for the Master Plan and has been involved in efforts to engage residents in the planning and design process. Still, he agrees more needs to be done to ensure indigenous voices are heard. A recently launched Master Plan steering committee saw its first tribal member, Chief Rudy Ortega with the Fernandeño Tataviam tribe, join in May. “For me to sit at the table … I’m able to champion the concerns and interests of the native community,” says Ortega, noting that “committee members are starting to grasp the importance of native plants” along the river like tule, often used by the Kizh for ceremonial basket weaving. But Ortega echoes Luna in stressing that more needs to be done to reach other indigenous communities. “What I would like to do is get more engagement with those other tribes,” he says. Enrique Huerta is with the nonprofit Lot to Spot, which works on turning vacant lots into park space for Los Angeles communities. He points out that when it comes to engaging tribal communities, planners have relied too heavily on door-to-door surveying and community meetings, where indigenous voices can quickly get drowned out. Disastrous flooding in the 1930s prompted the U.S. Army Corps of Engineers to pave over major segments of the LA River, preventing flooding but also burying artifacts and remains of cultural significance to the Kizh-Gabrieleño and other tribes. Christina Swindall-Martinez, of the Kizh-Gabrieleño, says her ancestors’ remains are buried by downtown’s historic Olvera Street, where 100 remains have been unearthed. Teutimez notes that other burial sites continue to be disturbed by transit projects around Union Station, where he says ancestral remains were found as recently as November. Tribe members suspect more remains can be found across the LA River watershed. 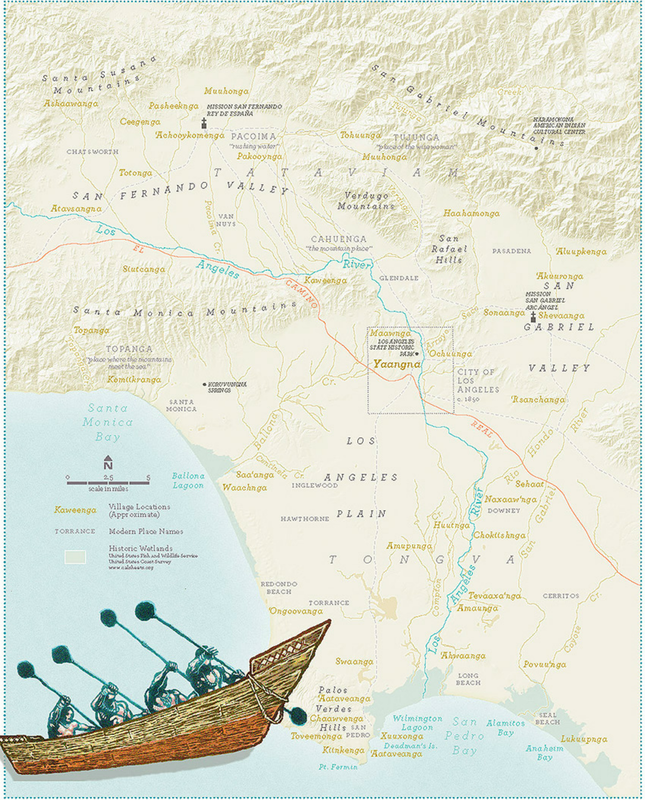 Major villages such as Cahuengna (Cahuenga), Ahaungna (West Long Beach) and Yangna (downtown Los Angeles) dotted the river and other streams. Near the river in downtown Los Angeles, indigenous refugee sites sprung up during periods of settler industrialization and forced labor, historians and tribes say. Pictured here, Kizh tribal chief Ernie Salas and his sister, Aguilar Salas Swindall. There are mounting concerns that the LA River’s revitalization will cause gentrification and the displacement of existing communities. In response, some riverbed plans have included ways to safeguard community benefits. But for Teutimez, talk of gentrification stokes fears about a repeat of history: displacement of communities along the river has its precedent in the displacement of tribal communities over centuries. “If it’s going to be changed and gentrified, we will lose a lot of the history that has its roots in tribal heritage,” says Teutimez. He points to past projects, including construction of a watershed education center at Whittier Narrows, as examples of successful partnerships between the Kizh tribe and developers. In that case, the Kizh worked with the Army Corps of Engineers, who Teutimez says consulted with the tribe, heard their history and ensured their concerns were addressed. “Without [that partnership] all the cultural resources would’ve been damaged,” he notes. It is the kind of consultation he would like to see for the LA River. This story was produced with support from UCLA’s Laboratory for Environmental Narrative Strategies (LENS) 2018 Watershed Fellowship for Ethnic Media.